I am told by our paediatrician that Joy is very advanced in speech, understanding and other development as compared to children her age. She can hold conversations in sentences with us about what she sees in a picture or in her surroundings, how she feels, what she wants to do or where she would like to go, dress and undress herself, sing entire songs on her own, recite the alphabet and the things that each letter represents, verbally spell her own name, count to 30, recognise numbers and understand the concept of “how many”, amongst others, mostly before she turned two and some of these, she learnt on her own. When I first sat down to think about how I’d like to teach Joy, I knew that I would have to start introducing learning habits early on in her life, because my goal is to raise a self-learning child. Joy learns best through pictorials, sounds, music, and rhythms so, we do song, dance and rhymes coupled with pictorial elements and use home learning resources along this line. 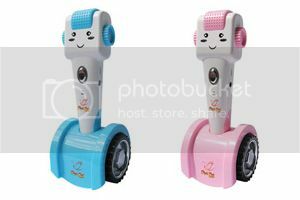 One of the home learning resources I like to use is Pen Pal Whizz, a pen learning tool disguised to look like a toy with a cute face. The tool improves on traditional book learning with technology by transforming any printed learning material to become interactive with responsive voices or sounds in any language. When Pen Pal Whizz is lightly tapped on the specially-coated books or stickers (more on these later), the preloaded audio file is activated and it not only recites written text, but also enables dialogue by the characters, give clues to play games on the pages, allows the child to practice reading after the narration or replay the narration if unsure and so on. Narration is done by professionals under guidance from education professionals, and each book is narrated by a few narrators to achieve variety and keep the child engaged. I like to create opportunities for Joy to engage with our home learning resources on her own so, she got to unbox her set of the Pen Pal Whizz the day after we bought it home. Pen Pal Whizz comes in either pink or blue, I choose pink not because it’s a “girl” colour but because she seem to naturally prefer the color over blue. Design-wise, PenPal Whizz is of a good thickness, so that young children like Joy can gripe the pen well. Although it is not indestructible, the tool is made with a special, hardy material to withstand hard knocks, perfect for use by little ones. The makers of Pen Pal Whizz has even thought of the situation where young children put the tools to their ears so the default volume level is not too loud but volume is adjustable easily. At 22 months, Joy was already able to do that! Although, you can actually use Pen Pal Whizz with any book, our Pen Pal Whizz was part of a bundle that also included books for progressive learning. 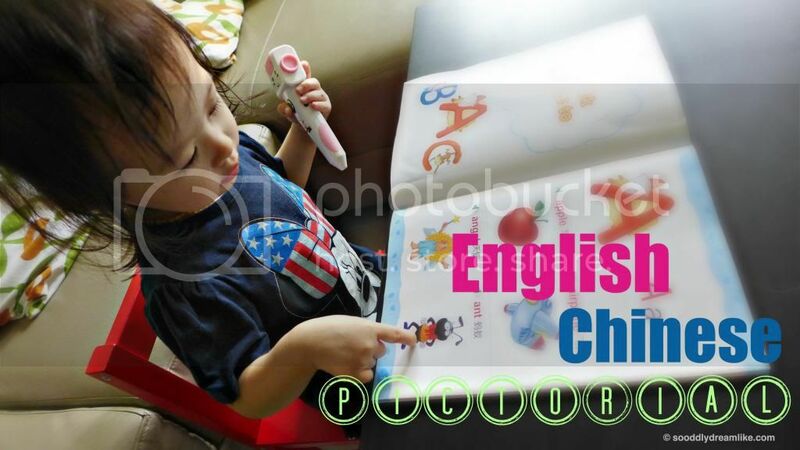 These books touches on English language, Chinese language, phonics, the Alphabet, idioms, stories and also songs. I’m very happy with the dual language books in particular. 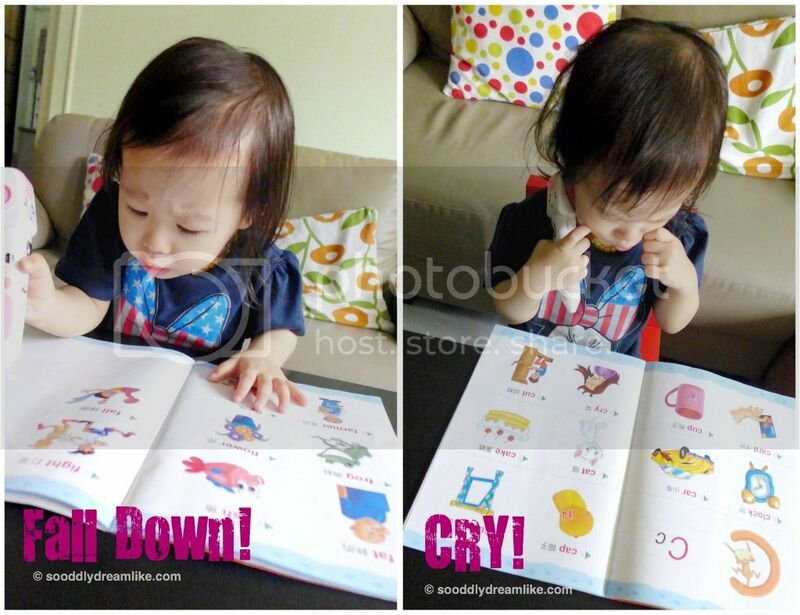 Joy likes to point to the illustrations and repeat after the narration when she uses the books so whenever she uses her Pen Pal Whizz, she is simultaneously learning through sound and sight. I’m also really pleased that she is actually learning on her own, even at her young age! When I’m present, we do the learning and the laughing together, in fact, I am now learning phonics together with Joy, using the books included in the bundle. The illustrations are lively and engaging, I often see Joy re-enacting what she is learning (dramatically!). Remember I mentioned that Pen Pal Whizz can work with any book? 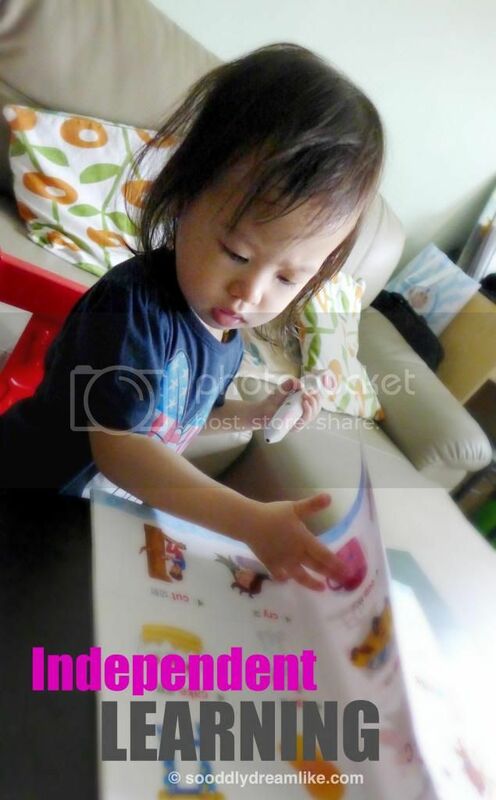 All you need are these inexpensive, specially coated recording stickers (S$9.90 per packet of 440) to easily record your own or your child’s voice as book narrations, learning of items pasted with the stickers or even, special family greetings and loving words. We use these stickers now for self-invented songs and I’ve started to record her singing for remembrance’s sake. Pen Pal Whizz is actually a 4GB USB device and music player. I load Joy’s favourite songs into it for her to listen to whenever she likes and we almost always invent different dance or actions to go along with the songs. Joy gets total freedom in what dance / actions she wants to do so she gets creative and its a little different each time. We always end up laughing and and having a good time. I decide on whether a resource is good for us or not easily – by observing Joy’s reaction from using them. Judging from how much fun and learning Joy enjoys with her Pen Pal Whizz, it is definitely a keeper. 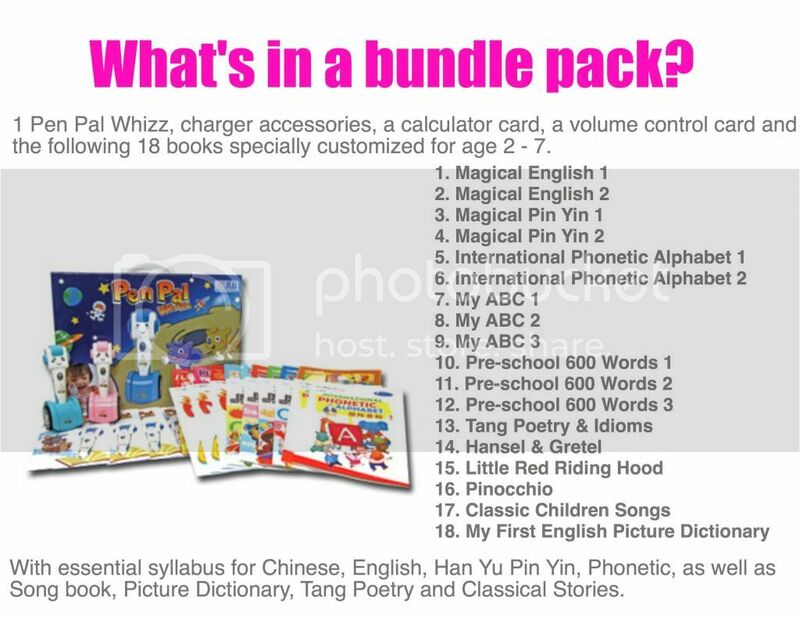 Here are the items included in the Pen Pal Whizz bundle, for your information. The bundle includes a 1 year warranty and option to choose either the pink or the blue Pen Pal Whizz. 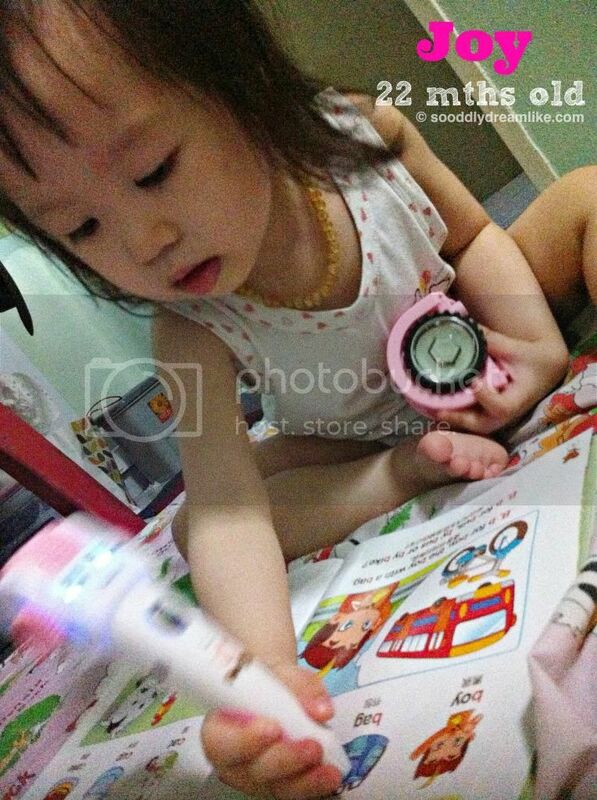 Currently, the Pen Pal Whizz bundle is retailing at a promotional price of S$188 with free delivery. I am confident that we will be able to use Pen Pal Whizz for a long time to come because it is compatible with over 100 English & Chinese storybooks, supplementary books for Maths, Science and so on, from renowned local publishers and authors like Emily Lim & Leana Doray. Besides, new books appropriate for kids aged 2-12 years old are added to their book library every month. You can also approach the manufacturers of Pen Pal Whizz, JLB Educational Technology Pte Ltd, to customise any book in any language to be made compatible with Pen Pal Whizz. Pen Pal Whizz is also the only reading pen in the market that is made compatible to our local curriculum. If you would like to try out Pen Pal Whizz yourself before purchasing, you can do so by visiting the retail stores listed here. To purchase Pen pal Whizz, you can contact contact JLB at 6776 6787 or send an email to enquiry@jlb.com.sg. To be updated on promotions, roadshows, new books compatible with Pen Pal Whizz and even educational tips, check out the JLB Educational Technology Pte Ltd Facebook page. JLB Educational Technology Pte Ltd has kindly sponsored a $80 gift voucher for giveaway to my readers! No minimum purchase is required and you can use it to either purchase the Pen Pal Whizz bundle promotional set (was $288, is now $188 on promotion, will be $108 if you win the voucher!) or, if you already have the reading pen, you can purchase other books compatible with Pen Pal Whizz. (3) Share this blog post from my Facebook Page and when sharing, tag my facebook page ( just type “@So Oddly Dreamlike”), JLB’s Facebook Page ( just type “@JLB Educational Technology Pte Ltd”) and tag a friend. 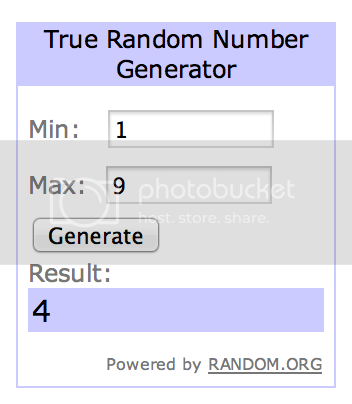 * Multiple entries for Step 3 allowed, but different friends need to be tagged. * Incomplete or inappropriate entries will be excluded. * Winner will be randomly selected by myself and announced by Sunday, 15 December 2013 on this blog post and on my Facebook Page. Winner must respond within 72 hours or a new winner will be selected. * This giveaway is in no way sponsored, endorsed or administered by, or associated with, Facebook. Congrats Shermeen (Yours was the 4th comment)! Disclosure: The $80 voucher is sponsored by JLB, no other compensation was received and all opinions are my own. Love the ability for self-learning, independent learning that comes with this talking pen. I like the function to record our own voices. We can go around sticking the stickers on different objects at home to help our children learn new vocabulary! I like the recording function, as it allows my child to be able to listen to me reading the book repeatedly, without me actually having to do so. This will come in handy when I want him to be a little more independent. To complete your participating entry, remember to share on Facebook, Adeline! I definitely like the independent learning bit! It allows some time for me to do the chores while my kids self-learns. To complete your participating entry, remember to share on Facebook, Shermeen! I like the recording function. I could record the names of things in the house and he could tap the pen around to learn their names. To complete your participating entry, remember to share on Facebook, Jolin! I have shared the post on my Fb. But I think on mobile nor able to tag. I like how it encourages independent learning in kids. My older daughter is a cleft baby born in the same month as Joy. Although my gal can speak quite a number of words, many are not accurate, i feel her pronunciation could be compromised due to the cleft. I like the function of the pen being able to keep repeating, to reinforce the pronunciation and allow my gal to get it right faster. The cute and interactive Pen Pal Whizz will keep my children engaged and excited. Since it can recognize English and Chinese characters and read to the user, it is extremely useful in language learning journey, especially if the language is hardly spoken at home. I like that the pen in billingual – very helpful in aiding the child learn languages that i am not proficient in at all!